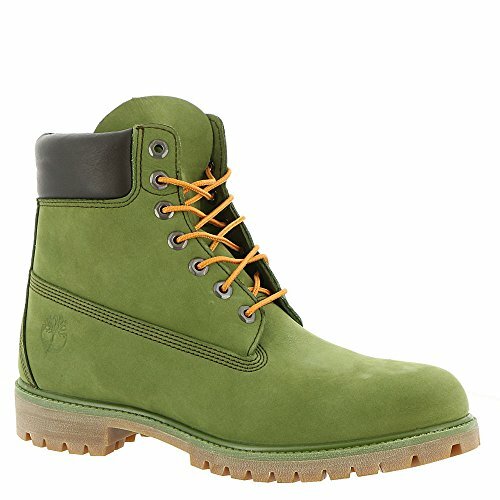 Timberland Men's 6" Premium Boot Pesto Waterbuck 10.5 D US | What Should I Say? When you think of Timberland boots, you're thinking of these. Our original waterproof boot was designed more than 40 years ago and remains a best-seller today, with tireless waterproof performance and instantly recognizable work-boot styling. Wondering about sizing? We recommend buying boots a half size down from your sneaker size. So if you're a sneaker size 11, order a size 10.5. 400 grams of PrimaLoft insulation. Durable rubber lug outsole for traction and durability is made with 15% recycled rubber. Classic boot laces made from 100% recycled nylon are re-engineered to stay tied. Weight of a single boot (size 9: 1 pound, 13 ounces).